This movie marks the third video game related documentary that I've watched as of late and yet another creative venture that was brought to life through crowdfunding efforts. To be fair, I didn't actually back this movie and instead just came across it by the time it was finally released. And given my other documentaries, I figured I was on a bit of a roll, or something other. Video Games: The Movie is yet another look at the overall development of the video game industry from its early beginnings to its current level of advancement. It features a variety of interviews including folks working within the industry and some celebrity fans who are just passionate about games. Each have their fair share of interesting stories and anecdotes about video games and all that other fun stuff. It's not the greatest documentary out there, especially in the context of all the different video game documentaries that I've had the pleasure of viewing as of late. If anything it's decent enough look back at video game history that still has a lot of decent value for folks. 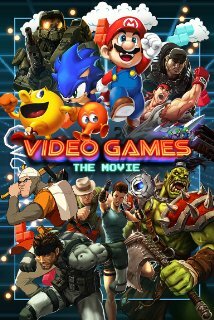 Synopsis: Video Games: The Movie is a 2014 documentary film directed by Jeremy Snead. It was funded by both an Indiegogo campaign and a Kickstarter campaign between 2012 and 2013 in order to get completed. The documentary was produced by Zach Braff and was narrated by Sean Astin. The documentary begins with a brief overview of the video game industry as a whole - from the meager attempts at creating games with much older computers to the various console wars and our current stock of next-generation consoles. And as we go through the history section, the documentary also includes a variety of interviews with many of the big names in the industry such as Nolan Bushnell and David Crane, and geek celebrity figures like Ernest Cline and Wil Wheaton. But after the history section, they start to explore certain key points in more detail and start expanding the discussion on video game culture. It discusses the shifts across the industry and what games become popular over others. And we see how different consoles come and go and various games make their make on geek cultural history. There are still more interviews with those who are shaping the future of the industry. And of course there's a good focus on those who celebrate video games - those whose lives have been changed because of gaming. On the surface, the movie has indeed assembled quite a rich variety of resource speakers and talent to make up the key strengths of this documentary. I totally wasn't expecting for them to cite individuals like Ernest Cline, but of course his work on Ready Player One nicely demonstrates his love for the video game world. It represented the sort of "taste" the production team had in terms of finding individuals to talk to that could discuss the brilliance of video games. The documentary is also teeming with video clips of many of the most popular games of past and present. Heck, the ending section about where video games is headed practically felt like a commercial for next-generation consoles like the PS4 and the Xbox One in terms of product shots and demo reels. I can only imagine the sort of deals that needed to be made to secure the rights of all those different games just to put them all together in one documentary. But at the same time my key concern was the distinctly American tone of the documentary as a whole. The historical view of the gaming world didn't even cite the rise of the Famicom in Asia and instead focused solely on the Nintendo Entertainment System. There were a few individual interviews with developers like Hideo Kojima and a section about Super Mario, but on the whole it felt like the contributions of Nintendo in general felt a little understated. For a documentary that claims to have gathered over 45 hours of footage, it felt like the editing decisions in terms of which stores got in and which ones didn't weren't quite a full representation of how the industry developed. And at the same time I suppose the sheer volume of content meant that not everything could fit. I think I could have appreciated more of a look at different game periods and the tone of what was popular and what wasn't based on historical trends and the most popular games of the game. On the whole, Video Games: The Movie felt like a decent look at the video game market as a whole but also felt a little shallow in its view of things. It could have been a lot more in-depth or many it could have tried to take a perspective on things that didn't feel so limited to the US resource speakers that they had access to. Thus the movie only gets a decent 3 consoles that left their mark on the world out of a possible 5.